Natural supplements for healthy eyes and eyesight - ESI S.p.A.
Every day the health of our eyes is threatened by UVA sun rays, artificial lights, PC screens, and dust in the air due to pollution or pollen. That's why our eyes need special care; to be kept clean and well hydrated in order to avoid inflammation and allergies. ESI line for Eye health uses natural active ingredients to enhance vision and protect the eyes. 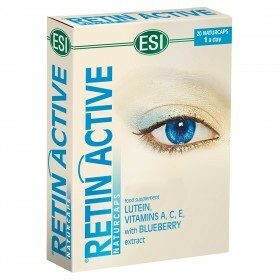 We have created a balanced formula product line called Retin Active that contains bilberries, antioxidants, vitamins A, C, E and lutein that protects the ocular tissues from stress and harmful environmental conditions. We offer a variety of products for each specific need: dietary supplements in the form of capsules that help improve eyesight and drops that hydrate the tired eyes.